The first hour after park opening or after 5 p.m. 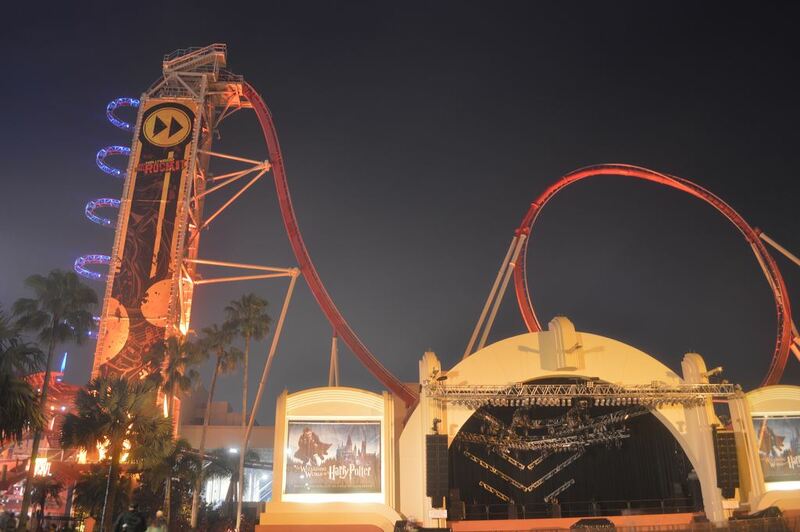 Opened in the summer of 2009, Hollywood Rip Ride Rockit is Universal Studios' candidate for the most technologically advanced coaster in the world. Well, that distinction didn't last very long, but for sure this ride has some features we've never seen before. 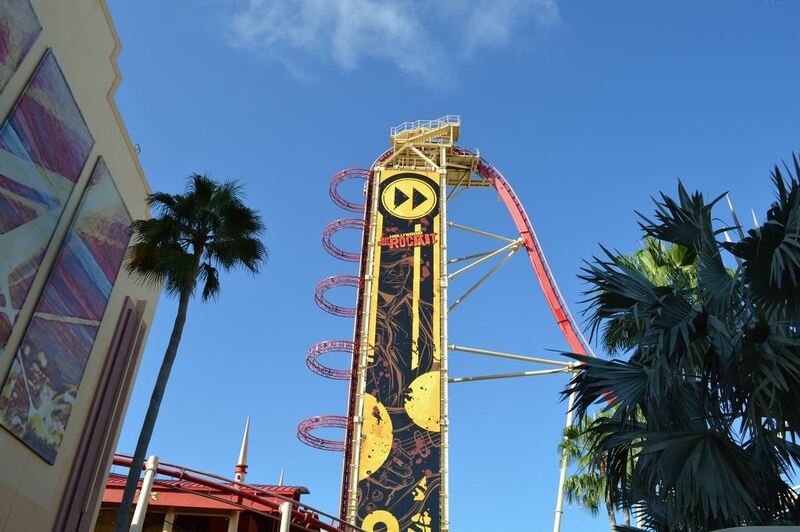 Let's start wit the basics: Rip Ride Rockit is a sit-down X-Car coaster that runs on a 3,800-foot steel track, with a maximum height of 167 feet and a top speed of 65 miles an hour. Manufactured by German coaster maker Maurer Sohne, X-Car vehicles are more maneuverable than most other kinds and use less restrictive restraints, making for an exhilarating ride. You ascend—vertically—at 11 feet per second to crest the 17-story-tall first hill, the highest point reached by any roller coaster in Orlando. The drop is almost vertical, too, launching you into Double Take, a loop inversion in which you begin on the inside of the loop, twist to the outside at the top (so you're upright), and then twist back inside the loop for the descent. Double Take stands 136 feet tall, and its loop is 103 feet in diameter at its widest point. You next hurl (no, not that kind of hurl!) into a stretch of track shaped like a musical treble clef. As on Double Take, the track configuration on Treble Clef is a first. Another innovation is Jump Cut, a spiraling negative-gravity maneuver. 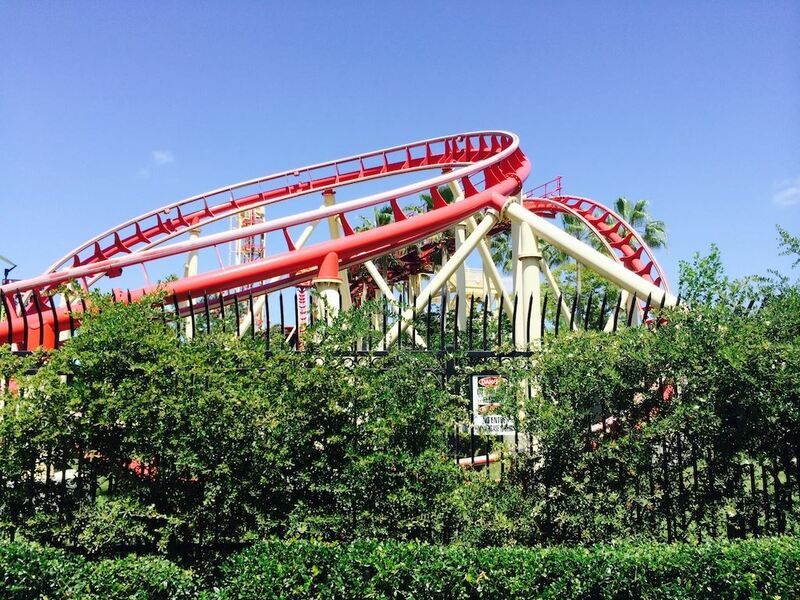 Usually on coasters, you experience negative gravity on long, steep vertical drops; with Jump Cut you feel like you're in a corkscrew inversion, but you never actually go upside down. Other high points include a 95-degree turn, a downhill into an "underground chasm" (gotta love those Universal PR wordsmiths! ), and a final incline loop banked at 150 degrees. The ride starts in the Production Central area; weaves into the New York area near Race Through New York with Jimmy Fallon, popping out over the heads of guests in the square below; and then storms out towards the lagoon separating Universal Studios from Islands of Adventure. Each train consists of two cars, with riders arranged two across in three rows per car. Each row is outfitted with color-changing LEDs and high-end audio and video technology for each seat. Like Rock 'n' Roller Coaster at Disney's Hollywood Studios, the "Triple R" features a musical soundtrack, but in this case you can choose the genre of music you want to hear as you ride: classic rock, country, disco, pop, or rap. The ride has dozens of “hidden” songs in its catalog. Press the Rip Ride Rockit logo on the number pad for 10 seconds then enter 113 to hear Metallica’s For Whom the Bell Tolls. Press 902 to hear The Muppets sing The Rainbow Connection. See this blog post for the complete list. When it's over, Universal flogs a digital-video "rip" of your ride, complete with the soundtrack you chose, that you can upload to YouTube, Facebook, and the like. The video intercuts stock footage of the coaster with clips recorded by your seat-mounted camera, but is not a continuous POV of your ride. 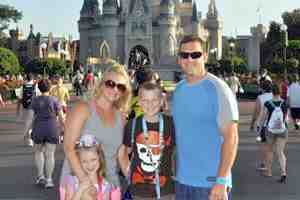 It costs about $50 and is not included with the My Universal Photos package, though still images can be added to your account for free. The loud music blasting in our ears cancelled out the sound of the coaster. If only they had a "None of the Above: Silence" button as a selection. The singles-line hint was a real time-saver. 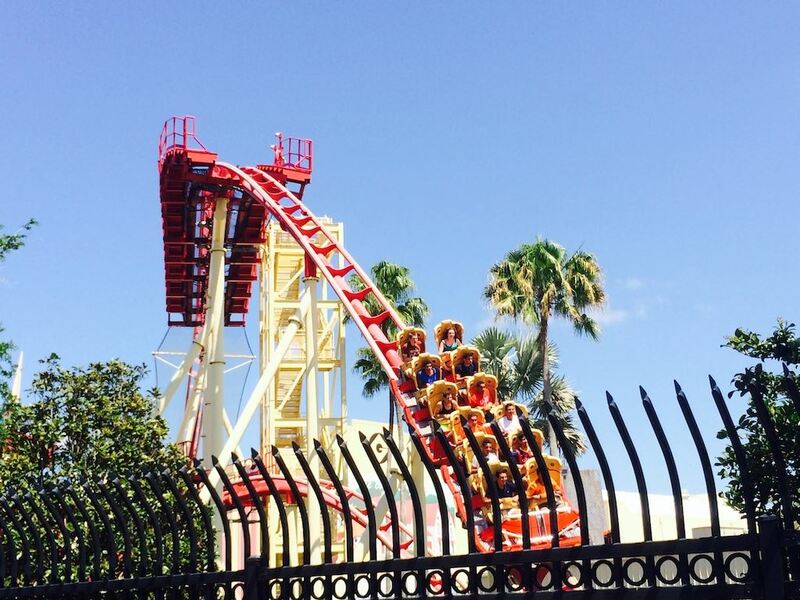 I would note for other readers that despite the fact that I love roller coasters and always have, and I am in good physical shape with no issues, the Hollywood Rip Ride Rockit hurt my back. My 17 year old daughter who also loves all rides didn't love it either. 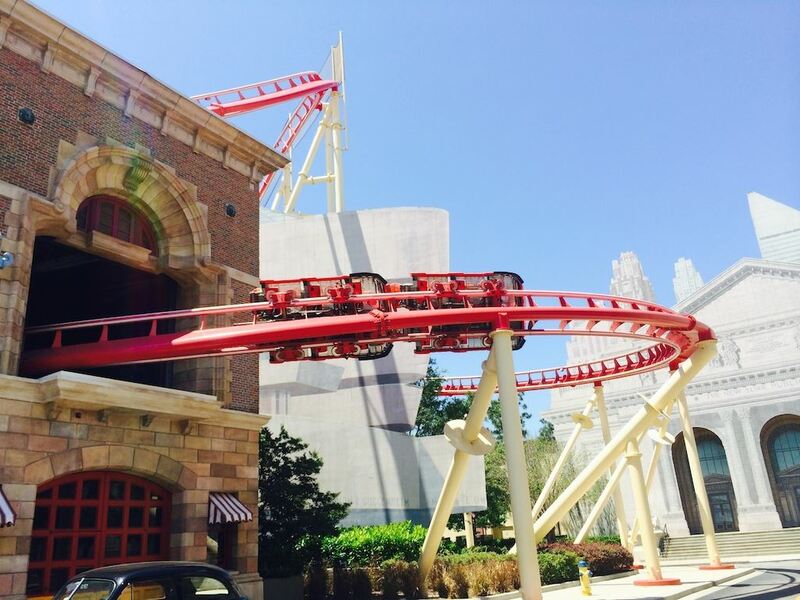 I've ridden many roller coasters in my 35 years, including some over 400 feet tall and with speeds in excess of 120mph, yet I've never ridden one that was as painful and rough as the Rip Ride Rocket at Universal Studios. With the beating that my head and neck took, I'll never ride that one again. 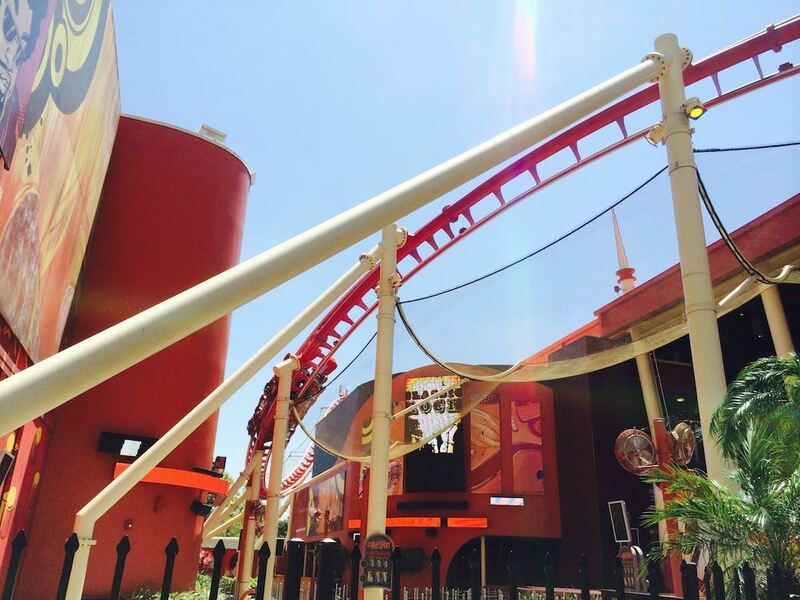 Hollywood Rip Ride Rockit can put more trains on the tracks simultaneously than any other coaster in Florida, which means on paper that the ride should be able to handle about 1,850 riders per hour. In practice, you'll wait about 6-8 minutes for every 100 people in the queue ahead of you, indicating an hourly capacity of 1,500 riders. Because the ride is so close to the Universal Studios entrance, it's a crowd magnet and creates bottlenecks from park opening on. Your only chance to ride without a long wait is to be one of the first to enter the park when it opens, although Diagon Alley has lessened the park opening rush a bit. This chart shows you roughly how long you'll wait for Hollywood Rip Ride Rockit when you visit on a day with a given Universal Studios Florida Crowd Level. The blue bars represent the average "peak" wait time (that is, how long the line will be at its busiest). The bottom and top black lines represent the range of peak wait times to expect (for you fellow nerds out there: it's the 5th percentile and 95th percentile of peak wait times). Please note that these are estimates, and for a better forecast for your travel dates, see Hollywood Rip Ride Rockit Wait Times. This attraction has a minimum-height requirement of 51 inches.